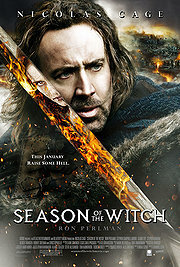 Nicholas Cage and Ron Perlman duo was the only reason for me to watch this movie. The title is a bit misleading though. The story wasn’t about a witch at all but the devil himself. The costume in the movie was incredible and it did have pretty good dark humor dialogue from Ron Perlman’s character. The makeup on the dying cardinal was very convincing of the black plague. I can think of a couple of cross-over scenes from multiple different movies. For example Lord of the Ring where Cage and Perlman are trying to beat each other on the number of killings and the finishing reading of the incantation from the unexpected character in The Mummy Returns. It was my first movie of the year 2011. Hopefully I will get to watch better movie next week.